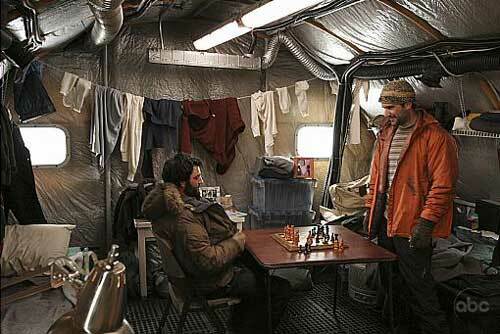 As with most Desmond-centric storylines, this was a great episode. Before I begin commenting, I’d like to point out that in a recent interview by Doc Jensen for EW.com, (“Lost: Mind-Blowing Scoop From Its Producers,” 2/22/08) Damon Lindelof mentioned that he and the other Lost producers are “pro time-space continuum bending” but “anti-paradox.” In other words, as far as I understand it, they believe you can move through time, but you can’t change anything. Anything you do would already have happened. 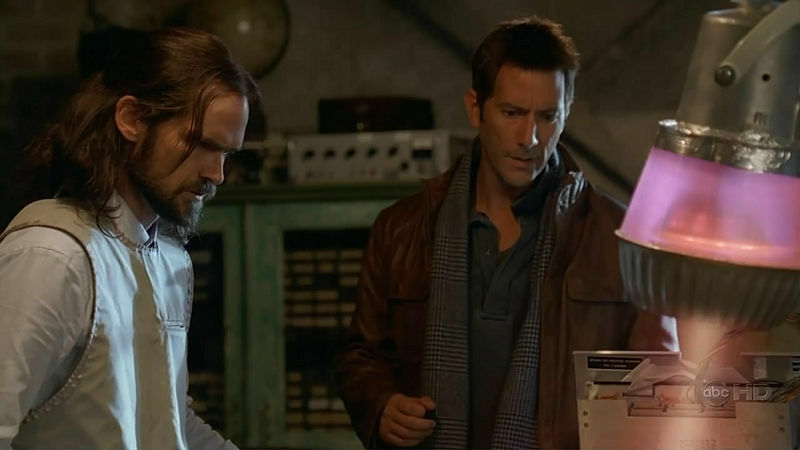 This non-paradoxical perspective is revealed in “The Constant” when Daniel Faraday tells Desmond that he “can’t change the future.” This being the case, since Desmond meets Faraday in 1996, the “future” Faraday in 2004 should have already met Desmond in his past. 1996 Faraday even mentions that his future self would likely remember having met him. Strangely however, we see that in 2004, Faraday does not remember. This is particularly odd since Desmond proved Faraday’s life long dream by claiming to be traveling through time and gave him the sequence to “discover” it in an experiment. Surely, future Faraday would remember. 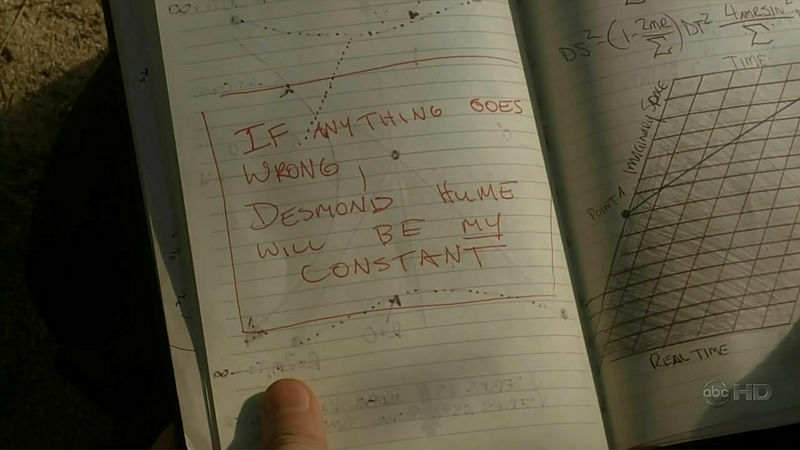 Yet, he doesn’t, and must search back in his journal, where he finds a reference to using Desmond Hume as his constant if anything goes wrong. Has his experiments messed with his mind? Perhaps, or perhaps being in a simulation, the time traveling in this case never happened. Maybe he learned of Desmond before entering and scanned or programmed in the information about him into a journal so he’d have it once he entered the system. There are really too many possibilities to even postulate. Certainly though, the time traveling does not harm the simulation theory. In fact, the time traveling in this episode completely supports it. Let’s not forget that Faraday even admits that only Desmond’s conscious mind is traveling through time. Well, what’s to say that he isn’t experiencing this effect while connected to the simulation? It does, after all, mess with your mind. Perhaps certain people, undergoing the intense (electromagnetic?) stimulation of the simulated world, do jump back in time in real life. Or, even just in their own mind as I originally assumed in the book. There is no definitive evidence disproving either possibility in this episode. Particularly since Faraday didn’t remember meeting Desmond and had to look his name up in notes that could have come from anywhere. One theory on this though is that Farady has memory issues from not covering his head when working with electromagnetic radiation. Even if he did remember Desmond though, both of the 1996 and 2004 meetings of the two characters could very well be happening in their minds, so again, it still wouldn’t matter. 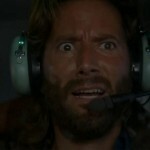 Being on the island, Faraday must now be plugged into the simulation too. This episode had a lot of interesting reveals. One of them, was the sequence that 2004 Faraday told Desmond to tell 1996 Faraday in order to make his time-space bending work. (Of course, despite the producer’s best efforts, this in and of itself is a paradox. If Faraday learns of this code from his future self, and his future self knows of it from his past self, where did the information come from?) That sequence was 2.342 at 11 Hertz. Obviously, 2.342 is made up of 23 and 42—part of the number sequence. This can be because they are actually in the simulation, so the glitch is still at work, or, the glitch is somehow related to the time-space bend. 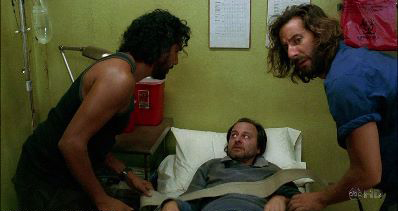 George Minkowsky, the communications officer aboard the Kahana’s (the freighter), is played by Fisher Stevens. Stevens was in the TV show Early Edition, which was about a guy who would try to prevent the bad future events from happening. He’d learn about the future events from a newspaper he’d receive a day early. Stevens was also in the 1985 movie, My Science Project, which was about alternative dimensions and time travel. This episode also mentioned Tovard Hanso as the former owner of the Black Rock ledger—a journal written by the first mate aboard the ship that somehow had gotten into the hands of pirates before the ship mysteriously disappeared. Tovard is likely related to Magnus Hanso, the owner and possible captain of the Black Rock, and Alvar Hanso, the CEO and founder of the Hanso Foundation, which may sponsor DHARMA. 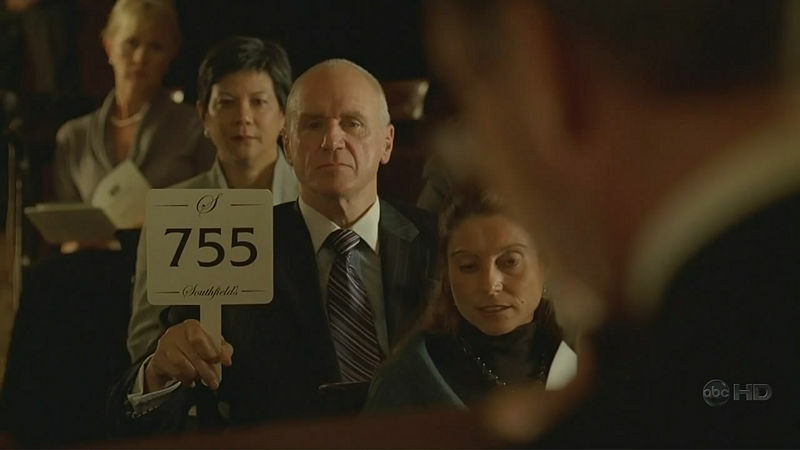 The ledger is being auctioned off in this episode. Incidentally, according to the auctioneer, the ship supposedly disappeared in 1845. Only problem with that is that the Black Rock had dynamite on board which wasn’t even invented until 1866. Unless the Black Rock didn’t have it and someone else put it there. Or, the Black Rock of the island isn’t the same one that disappeared, as the simulation theory would suggest. Or, the ship didn’t disappear in 1845 after all. According to both The Lost Experience and Find 815 online adventures, the Black Rock disappeared in 1881 which would make more sense. Anyway, Charles Widmore winds up as the highest bidder and gets the ledger. This insinuates that Widmore knows about the mysterious nature of the island and may have connections to DHARMA, giving weight to my theory that Widmore had these connections enabling him to somehow get Desmond into the simulation. Widmore may even be buying the journal not to learn about it contents, but to prevent others from doing so since it may contain information that DHARMA is trying to replicate in the simulation (or, reveal where it’s located). It definitely seems like Widmore knows something in this episode. Why did he leave the water running in the bathroom? Interestingly, it seems like Desmond was surrounded by water during many of his time leaps—either being on the boat, in the rain, or with the sink running. Perhaps this eases the transition? Whatever the reason, Widmore is up to something. Perhaps Widmore isn’t such a bad guy after all and has put Desmond in the simulation not to keep him from Penny, but to help him become a man worthy of her. Certainly, that would be a twist worthy of LOST. 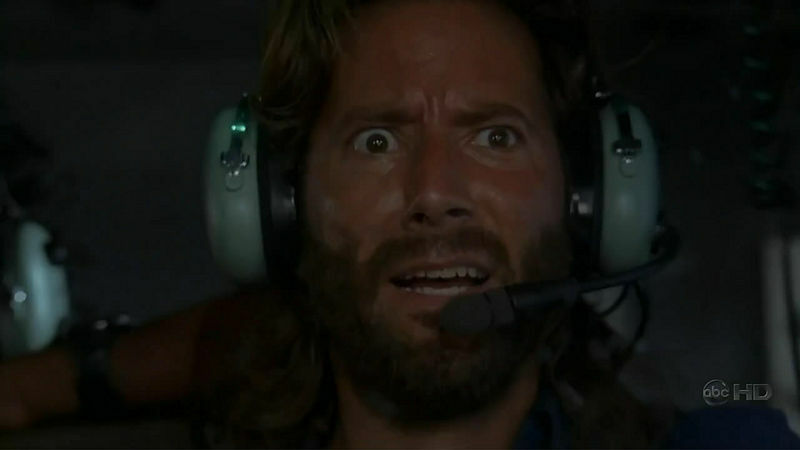 Another possible twist of the show which is more worthy of Heroes than LOST would be if Charles Widmore, Christian Shephard, Benjamin Linus, and the Ms. Hawkins, the ring lady were all in cahoots and sent the Losties to the simulation/island. Just something I thought I’d throw out there. One other fun fact from this episode discovered by a listener of the Jay and Jack Podcast, deals with Penny’s phone number—794-60893. If you rearrange the digits you get 867-309 with 9and 4 left over. Subtract 4 from 9 and you get 5, giving you 867-5309 Jenny from the Tommy Tutone song from the 80s. Jenny? Penny? Rearranged numbers? Definitely no accident. So, what is all this relating to in our world? Since I’ve said that the show is a metaphor for how our world really works, I say that this time traveling is very similar to dreams. I believe that we are all living in an illusion in this world, and get our lives “downloaded,” so to speak, from another dimension. I think that when we sleep, our soul enters this astral plane, or other dimension, and picks up information that it takes with it to our bodies when it returns to the physical, illusionary world (just as Desmond kept returning to his life on/near the island). 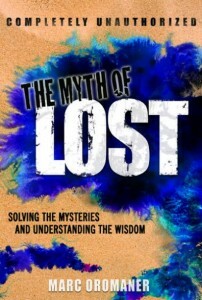 Our mind is often left with remnants of this other realm that it attempts to decipher. The best translation it can do of this other realm uses the symbolism and archetypes that are typical of dreams. Usually, much is lost in the translation, which is why our dreams are often so odd. What our mind needs, is a “constant” like the one mentioned in this episode.In the episode, Penny was Desmond’s constant—being the connection between his dream life and his real life. For us, our constant is our destiny—the path that has been given to us in our dreams that we are meant to follow in our lives. Without following this constant, we are unhappy and slowly begin to lose interest in our daily lives. This is similar to the episode when time-traveling George Minkowski dies (in the simulation A.K.A. the illusionary material world) when he does not have a constant. Desmond was able to have his with Penny, so now he has something to aim for—something that ties together his past and future lives, or imaginary and real life. Metaphorically speaking, he has a link between his destiny and his real-life actions. While it would be more typical if the Lost island represented the heavenly realm on the show, it seems to fit better as the simulated, illusionary world we live in. This would make the off-island flashbacks and flash-forwards more similar to the heavenly realm, since this is where the characters receive the downloads to complete their destinies—destinies which must be fulfilled in or around the island simulation. Of course, the island can also be thought of as being symbolic of heaven or purgatory. It works both ways really, cycles within cycles within cycles. For the most part however, the island is a microcosm of our world. This is why Desmond must now find Penny from within that realm, and not from the dream-like realm of 1996. By imagining all the flashbacks (and flash-forwards) as destiny dreams, and the island as “real life” we can understand what the characters are meant to do. The island, just like our world, is the playing field for them to live out the issues presented to them from their pasts, and in some cases, their futures.